Technology is fleeting, it is dynamic. To maintain its relevance in the ever-changing technology, it has become increasingly important for mobile app development solutions to keep evolving. No doubt mobile app development is there at the forefront of the smartphone technology. but the emergence of new markets, technology and domains have given rise to new trends in the development of mobile apps. These have become crucial for its existence, keeping itself relevant, and most importantly, for remaining in the competition. It is all about staying fresh, changing with the change in time. Maintaining a standard position which can help your mobile app remain in the trend, and not get stagnant or irrelevant. So without wasting any time let`s get straight to the latest trends in mobile application development technology. These could help your app remain relevant, dynamic and flexible. It is all about user experience with mobile, feeding data relevant to the user. And keeping track of user behavior as AI has become an inevitable component of mobile app development services. The outcome of AI has been revolutionary, direct representation of which is AI chatbot that made conversation with technology possible in reality. It would be suitable to quote here the data that shows interaction with chatbots would rise to 93 percent – from 20 percent – by 2022. To store the unlimited data generated by the user efficiently has been rendered easy with the advent of cloud computing. It has made multi-tasking speedy and made general mobile operations fast. What comes with cloud computing services is enhanced security, more speed, and consistency in mobile apps that have gone a long way helping reduce storage problem, and collecting the maximum amount of relevant data for analytics to transform into useful business insights. One of the game-changers in mobile app development solutions is the emergence of IoT. It has made sensor technology a common thing today. As many devices come with embedded sensors for various purposes ranging from health and fitness to door locks, from fire alarms to switching on and off lights. To connect with those sensors remotely mobile apps have become indispensable. These apps not only perform the function of supervising those devices, automating recurring tasks but in synchronizing data generated across IoT enabled device. Such mobile apps have become the next trend in mobile technology. Wearable devices in the form of smartwatches and other such kinds have become immensely popular in providing the latest mobility solutions. Now a new market has opened up which is ready for further exploration with the help of wearable apps. As these devices are connected to the mobile devices for performing or assisting various tasks , it can be done alone when we have an app in mobile to execute such tasks as making and receiving a call, accessing our smartphone right from the smartwatch, keeping track of our fitness, receiving notification right on our smartwatch about the task we have already planned, and so on. A study has revealed that by 2020 the number of devices connected to mobile technology would rise to 830 million. Mobile technology has made it possible to make payments and transactions digitally. It has given rise to a new kind of business called e-commerce. Today there are not only the ones but tens and hundreds of apps for conducting mobile payments available in app stores. Banking through mobile is today as common as making a call. That is not the end of it. However, it has given birth to a lot many innovative modes of payment systems, be it cryptocurrency development services or paying by scanning your card. So payment app for mobile is a trend to ride on. One of the significant challenges mobile application development has been posed with is the security of mobile apps. It has given many nightmares to the mobile app developers. But they have remained steadfast to develop new security features to make mobile apps secure. The outcome of their efforts is security features such as encryption, multi-level authorization for access to the app and the least easy availability of information like an app code. In smartphones these days, motion sensing is not the only cool feature that has improved the user experience. It has revolutionized the way we play games on smartphones. But still, I feel location sensing is the coolest feature. It has resulted in the development of apps that give the real-time location of the users. These assist in managing maps, and above all, offer a real-time view of the traffic. To navigate has become a lot more comfortable on a smartphone with the help of location sensors. Keeping in mind these top trends can give you a glimpse of how far mobility has progressed. It would not be wrong to say, that applications have become an indispensable component of mobile technology. To imagine a smartphone without any app installed on it is quite an impossible thing. At the same time we have seen how new technology has created more scope for mobile app development solutions, and having a mobile app is today imminent for daily service business. After all, you won`t desire to create a remote app out of sheer ignorance. Get the best mobile app development in India! The trends I have deliberated on are not the only ones out there. But they are undoubtedly the most common trends. These are of more significant influence in the business world globally. It is no longer impossible to do location-based marketing. Keeping track of user experiences like trends, tastes, and choices for executing personalized marketing is a must. It is the reason that most of these apps come with features like location sensing, and so on. 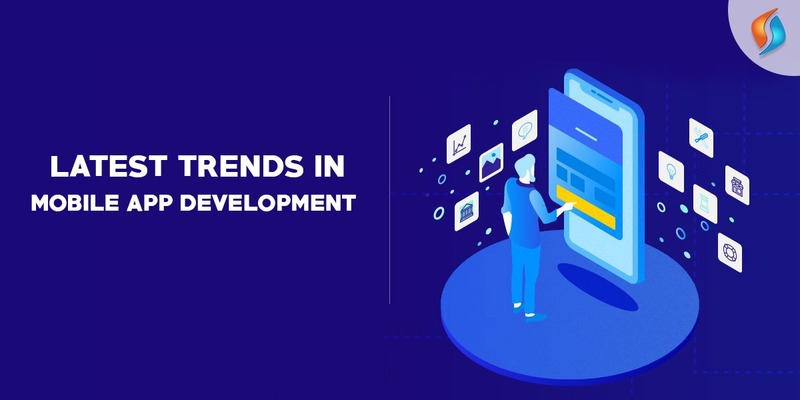 As a mobile application development company, you would either have to upgrade an app to incorporate these trends to make it relevant to the market demand or you`ll have to pay special attention to these latest trends in the mobile app development solutions to create mobile apps that are fully embedded with features modern technology demands. It is the matter of keeping up with the mood of the times to never miss on the target, market, and profit. So if you also wish to take the services of a mobile app development company in India, our team of developers is always at your service. Feel free outsourcing to India and contact us here, and we will revert at the earliest.